fruit . root . leaf . : "Drawing a Blank"
One of the greatest challenges facing us when drawing “from life” is the temptation to draw expectations and preconceptions. 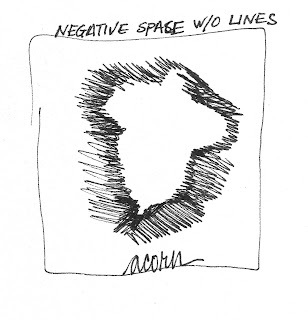 Negative space drawing encourages you to consider not only the space occupied by your subject (positive space), but also the space around it (negative space). In so doing, you will see what you are observing from a new perspective. Emphasize the placement of the subject in its surroundings. Focus on the relationship between the parts of the subject, such as branches of a tree, or leaves on a plant. Concentrating on the space between each part enables you to more accurately represent this relationship. Hand-eye coordination is enhanced, as your mind and eyes direct your hands. Your focus on the space around the subject enables you to let go of concern about the way the subject itself "looks." Negative space drawing is a method for drawing “honestly,” rather than just drawing what we are conditioned to “see in our minds”. For example, think of the typical child’s drawing of a tree, versus the many kinds of trees visible in the world around us. Negative space drawings help us overcome the habits or symbols we often revert to when drawing. 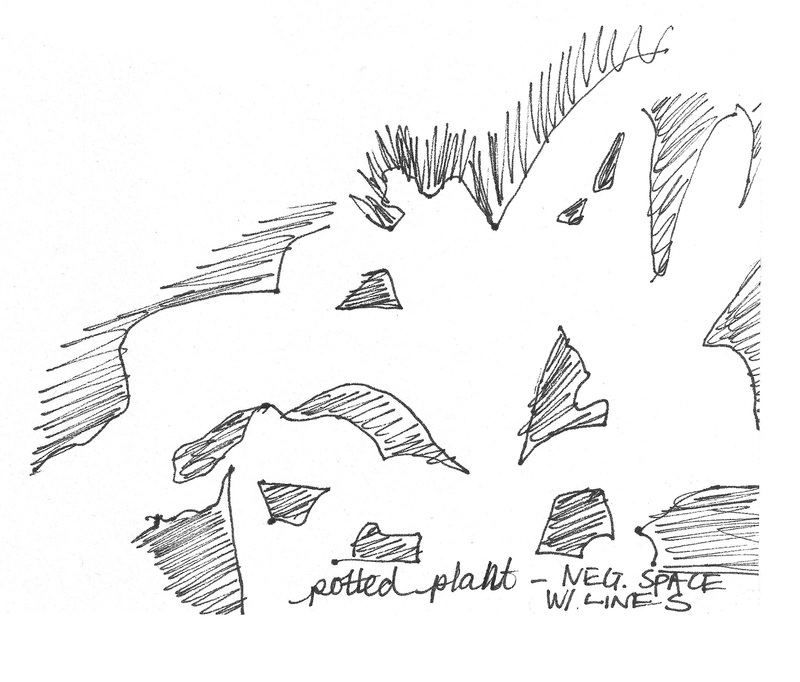 Use negative space drawing to settle and focus your attention, as it transfers typical sketching focus from what is perceived (pre-formed images in our mind) to what is actually being observed (seeing the true details and form of the subject). Negative space drawing is particularly useful when organizing a complex drawing, or when you wish to represent a subject in a fresh, or even abstract manner. 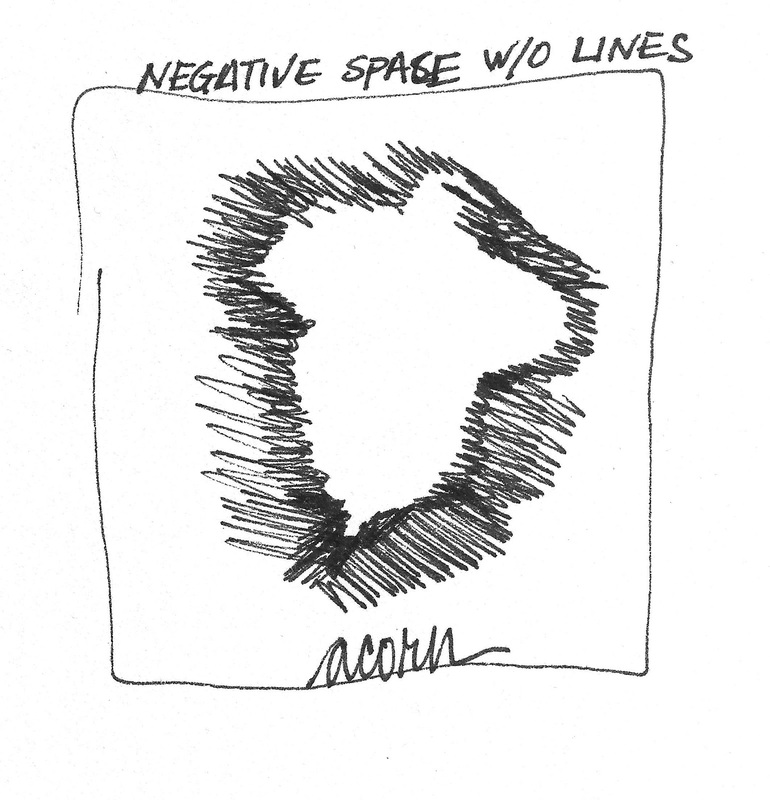 Negative space drawing can also be used to warm up at the beginning of a drawing session, or to re-invigorate yourself in the middle of a drawing when you are stuck. Begin with quick drawings, and gradually increase the time. This will familiarize you with the process of identifying negative spaces, and you will be able to utilize longer drawing periods without feeling like you are just filling in blank space. 1. Making an outline: Place one hand on a piece of paper approximately 5” x 5” in size. Your hand should not fully fit on the page. Trace your hand with your other, using a pen, pencil, marker, or whatever media you prefer. 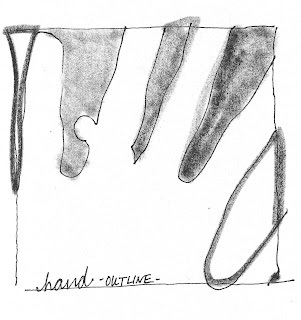 Be sure to trace all details, such as jewelry, which protrude from the surface of your hand. Trace along each part of your hand until you run out of paper, and be sure to trace all edges of your hand which rest on the page. You have made an outline, which emphasizes the shape of your hand. 2. Identifying negative & positive space: Look closely at the spaces between the parts of your hand, the gaps on the paper which are the spaces between your fingers, etc. This space is the negative space, the space around your hand. The space your hand actually takes up is known as positive space. 3. Enhancing the negative space: In order to visualize the negative space more easily, take a thick marker and trace around these shapes which are between the parts of your hand. Now, color them in. What remains uncolored, the positive space of your hand, is now clearly defined by the negative space. 4. An outline is NOT a negative space drawing, because it emphasizes the positive space. The following approaches focus on how to make negative space drawings using a few different techniques. Select a subject, such as a potted plant, or a tree. Focus on the negative spaces, and think about the shapes they most resemble. 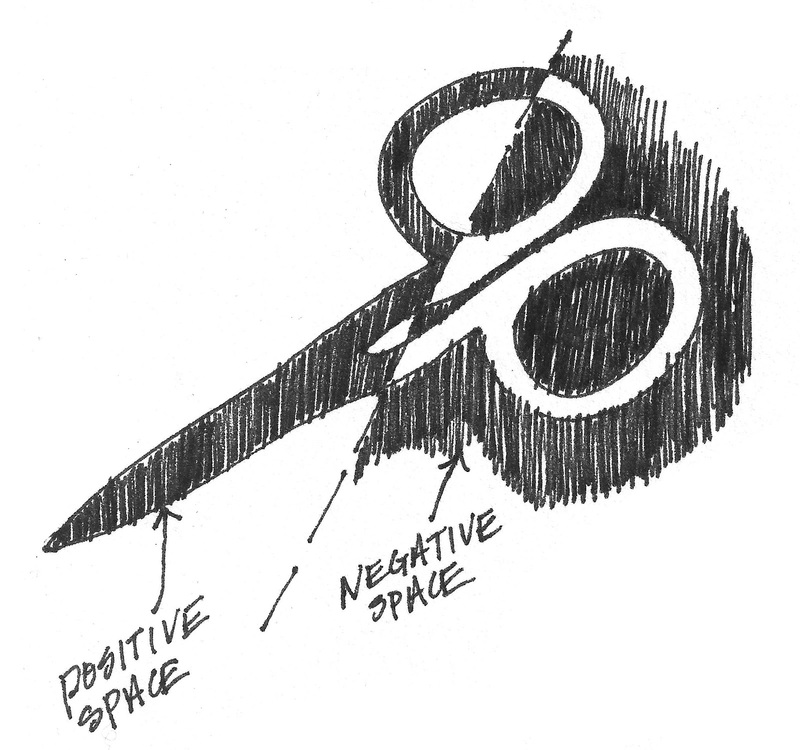 Draw the negative spaces, resisting the urge to draw the outlines of the positive space of the subject(s). Think about relative size, angles, and locations (adjacent, above, below) of the negative spaces. When you have drawn in the spaces, fill them in to more clearly define both the negative and positive aspects of the drawing. You may find it helpful to draw a frame on your paper, in which to draw. OR, fill up the entire page. Repeat the technique above, with the following adaptation. Use a viewfinder[i] to narrow your focus to just one part of the subject. Hold the viewfinder in front of your face, and focus only on the part of the subject which is framed by its opening. Pay attention to how the negative spaces are placed within the frame of your viewfinder. Select your subject. Observe it closely, and identify the large and small negative spaces. Pay attention to the boundaries between the positive and negative spaces. Using a large marker is helpful for this activity. Draw only the negative spaces, without making any boundary lines to distinguish the edge between negative and positive spaces. Use large bold marks to fill in the negative space. The void empty space on your page represents the subject, and the negative space fully defines the subject in this approach. [i] Viewfinder: Cut a 3” x 3” square from a piece of paper or cardboard. Cut out the insides, making a 2” x 2” opening in the center. The size of your viewfinder and its opening can be adapted to suit the shape of your subject, or the finished drawing you intend to make (think panoramic or tall and narrow, etc.). The use of a viewfinder is also helpful when identifying parts of a scene which will make an eye-pleasing composition. Move the viewfinder around until you see something you like, and then focus on that part of the scene. [ii] This is third-party content. It is provided only as a reference for individuals seeking additional content on this subject.